Buses can be annoying – you wait for ages, then three come along at once! Well the same can be said for Paul Smith PS shirts on eBay recently. In July last year, when news broke that Matt Smith was wearing a Paul Smith shirt, everyone was frantically looking to find where to get hold of one. Supplies quickly ran out, and the old reliable fall-back of eBay came into its own when the occasional shirt did appear ever few weeks. Some went for reasonable prices, others a bit higher if two bidders went head-to-head. But recently there have been fewer and fewer on offer, until a couple of weeks back. The recent spate of shirts have all been of the blue flavour, and each has been interesting different from each other. STRIPED CUFFS - SCREEN ACCURATE? 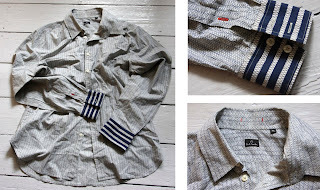 First to be listed, on 1st July, was a very unusual PS shirt (see below). It was notable for having striped cuffs, but with a top-stitching unlike any I have seen to date; it also had a unconcealed button-stand; and a slightly fitted back. It is the first shirt I have seen with a red buttonhole on the placket, which is visible on-screen, especially in The Eleven Hour. To date, this is the closest I have seen to the screen-worn shirts. It had an amazing starting price of just £1, but sold after 28 bids for £250. Then on 10th July another shirt appeared on eBay (see below). This was a standard shirt, the same as the ones available from johnanthony.com last year. It had a concealed button stand; plain cuffs; and is likely to have had a heavily tailored back and a breast pocket as the John Anthony shirts did, but it was not possible to confirm this from the photos. 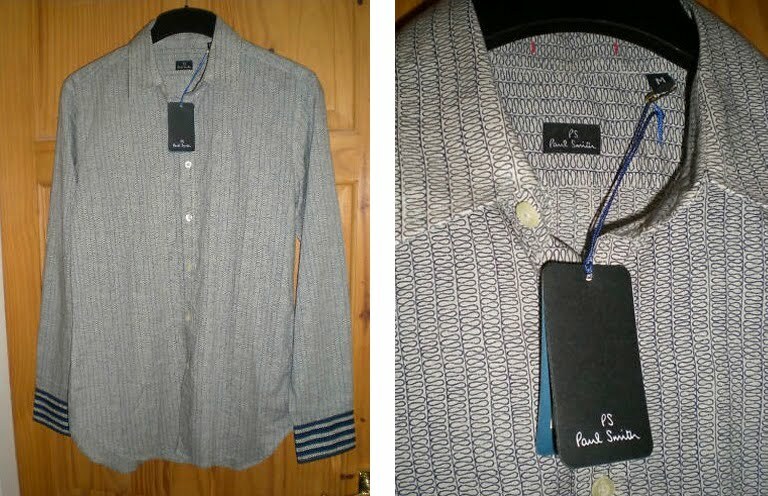 It had a starting price of £40, and sold after 15 bids for £105, which is in line with the price of some new Paul Smith shirts. Finally worth mentioning, is another shirt that was listed on 13th July (see below). This appears to be identical to a shirt I bought from tobi.com. It has striped cuffs; an exposed button-stand; and looks to be the more generous fit. This opened with a £10 staring price, but quickly spiraled out of control, and by the time it closed 10 days later, it had reached a staggering £650!!!!! In September 2010 Ryan put his unusual burgundy PS shirt with French cuffs up for sale. There were some nice detail pictures of the shirt, including those cuffs. From a starting price of $99, the bidding soon was creeping up, and by the end of the auction it had reached $350 (£226 to keep it in context with the other shirts above). A bit of a hint – I can’t wait to see those cuffs at first hand . . . Finally, as a reminder, here is a list of the variations I have seen in the Paul Smith shirts using the distinctive squiggly design. If you have another variation not listed here, do drop me a line. Matt Smith's red shirt definitely has the top stitching it can even be seen in your banner image on the right. So either the first one was modified, which i don't think it was because the seller didn't even know he had an eleventh doctor shirt at all until his first listing of it was mentioned on Gallifrey Base, or that first one is screen accurate. I wish I had a shirt now to sell for 650 GBP!! 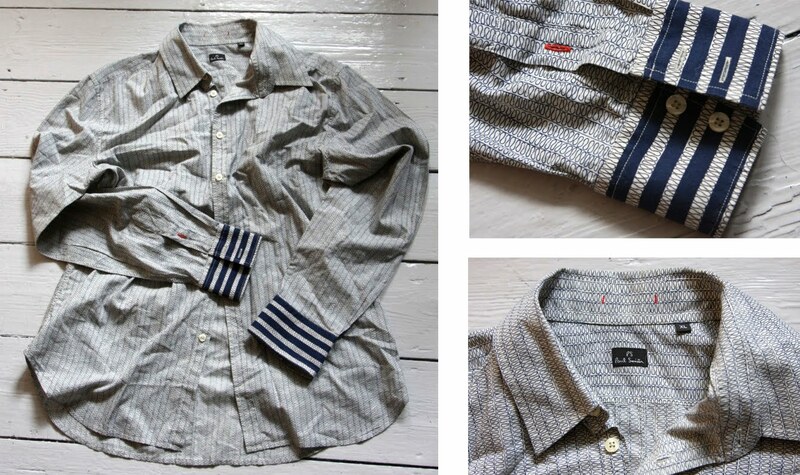 @stephen p. - I sorta agree - but the top-stitch is set further in on the shirt that sold for £250 - besides it has four stripes, not five as Matt's has . . . .
How many versions of this shirt did they do?! Whoa, that's an expensive shirt. I hope I can find one of these, eventually. When it comes to details that differ between them, I'd be completely lost without your blog. Thanks for posting!